The Monday Night Miracle saw the New York Jets and the Miami Dolphins match-up on the American institution that is Monday Night Football at Giants stadium, New Jersey, each with a 5-1 record and each looking to sit atop the AFC East alone and in first place. In the UK, the game was brought live on (and on and on) Channel 5, with coverage beginning shortly after midnight in the early hours of Tuesday morning 24th October 2000. By the time Channel 5’s early morning news was ready to air live at 6 am UK time, the game still hadn’t finished, the presenters were in a broom cupboard and many viewers who had stayed with the coverage all night were preparing their own game plans before putting them into action by ringing in sick or putting in last minute holiday days, drained and exhausted after witnessing not only one of the greatest NFL regular season games ever played, but one of the most memorable TV broadcasts of the NFL in the UK. 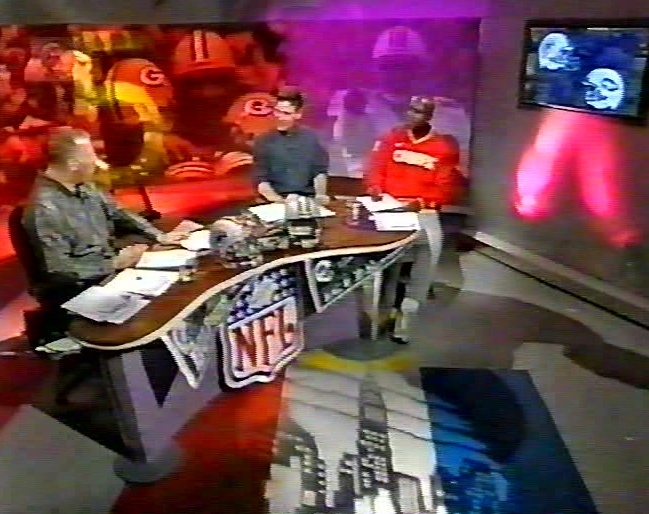 At that time Channel 5 normally brought the Monday night game the following evening, as-live. 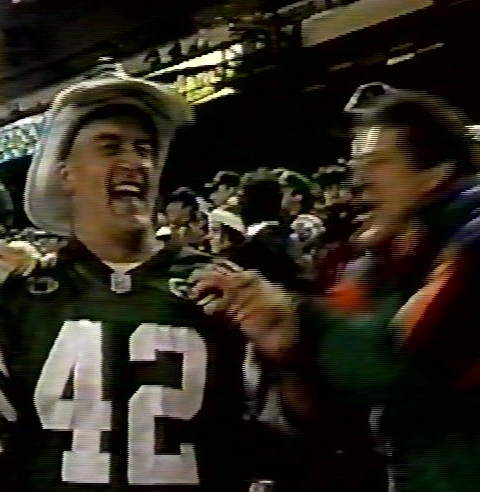 But due to it’s live coverage of Baseball’s World Series (which in 2000 was an all New York affair between the Yankees and the Mets) the Dolphins and Jets match-up was shown live instead. “We’ve picked the right one to be along live for you I can assure you,” Channel 5 presenter Mark Webster informed the UK viewers as their coverage began. He couldn’t have realised how right he was. Regular Channel 5 analyst Mike Carlson joined Webster in the studio along with special guest, former London Monarchs tight end Gerry Anderson. The New York Jets and Miami Dolphins had a history of putting on great gridiron contests. From the days of Joe Namath and Bob Griese in the 1970s, to the passing duels between Dan Marino and Ken O’Brien in the 1980s, and Marino’s infamous “Fake Spike” play in a 1994 showdown. They were about to add to that history. The game itself kicked off just after 2 am UK time - 9 pm in New York. Miami’s first drive took over seven minutes off the first quarter clock and resulted in a field goal and a 3-0 lead. Following a Jets punt they struck again. 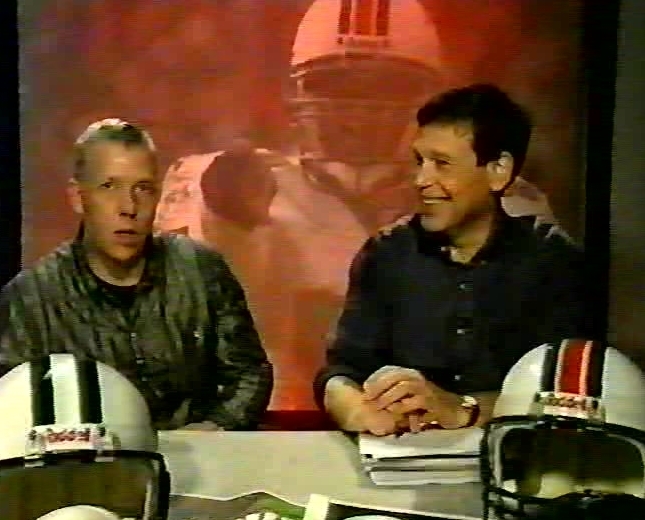 This time, quarterback Jay Fiedler hit receiver Leslie Sheppard for a 42-yard touchdown strike. The Dolphins were ahead 10-0. They would score again on their next possession when running back Lamar Smith took the hand-off from Fiedler and went around the right side of the line for a 68 yard touchdown run. Dolphins 17, Jets 0. The home crowd was stunned. The second quarter didn’t get any better for New York as Jets’ quarterback Vinny Testaverde threw an interception straight to Miami’s Sam Madison which resulted in another Miami field goal to stretch their lead to 20-0. The Jets finally managed to get on the board late in the first half when Testaverde hit wide receiver Wayne Chrebet from 10 yards out before the Dolphins responded with another field goal to make the halftime score 23-7 in favour of Miami. By the end of the third quarter though, the Dolphins had increased their lead to 30-7 on the back of another Lamar Smith touchdown run, this time a three yard scamper. However, as the final period began, the New York Jets would indeed, be back! New York began to work the ‘Monday Night Miracle’ primarily by using short dump-off passes to running backs, Richie Anderson and Curtis Martin and were very soon approaching Dolphins' territory. Miami penalties also aided the drive. From the side line Dolpins head coach Dave Wannstedt screamed at his defense in frustration, “Come on guys!” He could sense a shift in momentum, even at 23 points ahead. On second-and-14 from Miami’s 31-yard line, Vinny Testaverde stepped into the pocket and fired a pass towards the corner of the end zone. After the ball hit the arms of Miami safety, Sam Madison, Jets’ wide receiver, Laveranues Coles hauled in the pass and fell in the end zone for a touchdown. It was his first score as a professional football player. New York, questionably, went for a two-point conversion following the score instead of simply kicking the extra point. The attempt failed, but the lead had been narrowed, and now stood 30-13 in the Dolphins favour with 13:49 left in the game. Following a Miami punt, Testaverde led the Jets down the field again, eventually finding tight-end Jermaine Wiggins for a 1-yard touchdown reception. After John Hall kicked the extra point the Miami lead was suddenly cut to only ten points, 30-20. While the Dolphins took over possession and ultimately punted the ball back to the Jets, in the Channel 5 studios, with Gerry Anderson having left the broadcast, Mark Webster and Mike Carlson were making their way quickly to a store cupboard to continue the show. “In those days we did the show from the same studios as the breakfast news,“ Carlson informs. “We had to be out of there by five-thirty am so they could reset the set for the breakfast news, and also rehearse. Normally we would be off the air just before that if the game went relatively smoothly. If the game went over they had an emergency studio prepared for us, which was basically a broom-closet with two chairs and a little remote camera that was aimed at the chairs. I remember it was incredibly cold in there as well. Following the Dolphins’ punt, the Jets again managed to put points on the board, this time courtesy of a 35-yard field goal by John Hall. The score was now 30-23 with 5:43 left in the game. Less than two minutes later, following a third straight Miami punt, New York tied the score 30-30 as Testaverde lobbed a pass to receiver, Wayne Chrebet, the same Wayne Chrebet that Arnold Schwarzenegger had said would “pull it off”. There was 3:55 left in the game. Giants Stadium erupted. Despite being considerably empty, it sounded completely full. For those who were already in their cars on their way home, radios on, they were beginning to regret leaving the game early. This was turning into a classic. As the Jets kicked off Miami’s Brock Marion brought the ball all the way out to the Jets’ 46, giving the Dolphins great field position for their next drive of the game. They took advantage of it on the very next play. Fiedler took the snap, rolled out of the pocket to his right and launched a pass directly down the field to wide receiver, Leslie Shepherd who claimed the touchdown. After Mare kicked the point after, the Dolphins had retaken the lead 37-30. The clock showed there was still 3:33 left in the ball game. The Jets took over possession and as they had done throughout the entire fourth quarter they worked their way steadily towards the Dolphins’ end zone as if the outcome, at least to them, was in no doubt whatsoever. As the two-minute warning announced itself, New York faced a huge fourth-and-1 at the Miami 4-yard line. Vinny took the snap and fired a pass to Richie Anderson, who, under great pressure from the Dolphins' pass coverage as well as taking a hard hit from linebacker Zach Thomas, held on to the ball and got the first down for his team. After the Dolphins stopped Curtis Martin for no gain, second-and-goal came into view. The Jets broke their huddle and walked to the line of scrimmage. Vinny took the snap, stepped back into the pocket, and floated the ball to offensive lineman, Jumbo Elliott, who after bobbling the ball, finally scooped up and hung on to the pigskin, bouncing off the ground as he fell. Unbelievably the Jets were within an extra point of retying the game with forty-two seconds left to play in regulation. Hall kicked the point after, and bar another miraculous score, the game was heading into overtime. New York had scored 30 points in one quarter of football, and had also racked up 19 first downs. At this point though, UK viewers had to leave the action. The fourth quarter alone had taken just over 90 minutes in real time to play out. John Hall did eventually kick the winning field goal from 40-yards out just over six minutes into the extra period to give the Jets a 40-37 victory in the longest Monday Night game ever, and arguably the most exciting. The result was indeed shown on the Channel 5 news that morning, and there was an extended highlights of the overtime game shown in the results package the following week. The game is ranked as one of the greatest comebacks in NFL history, but for UK viewers the contest will be remembered as the game that went on, literally all night. For UK viewers, it was not so much Monday night, but the Tuesday Morning Miracle. 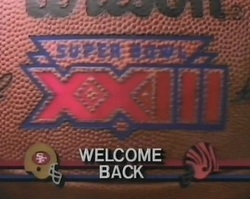 In this On The Sideline featured article we take a look at Super Bowl XXIII. Not only the most exciting Super Bowl of the 1980s but the first true classic game that UK viewers saw unfold live on their screens. It was also Bill Walsh's last game as 49ers head coach as well as the rebirth of the legendary Joe Montana. 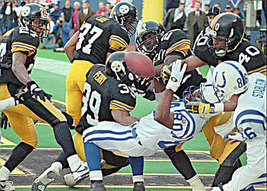 ​In Captain Comeback Harbaugh, The Cardiac Colts And The Lost Miracle Of The 1995 AFC Championship Game we look at the 1995 Indianapolis Colts - a team led by Jim Harbaugh who developed a habit of bringing his team from behind and almost took them to the Super Bowl, coming up one caught hail-mary shy in the AFC Championship game. 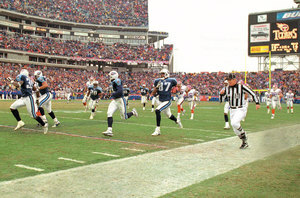 ​In The Music City Miracle And The 1999 Tennessee Titans - A Team Three Years In The Making Who Fell One Yard Shy we look at the 1999 Tennessee Titans - a team who had "roamed" the NFL in 1997 and 1998 only to make it all the way to the Super Bowl in 1999, winning one of the most controversial playoff games in recent history along the way.